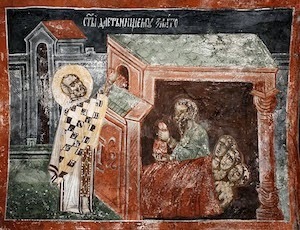 It was on this date in 343 AD that St Nicholas died - and the origins of Santa were born. You see the story of Santa begins with Nicholas. Born in Patara, Lycia (now Turkey) in 270 AD, Nicholas’s wealthy Greek parents raised him to be a devout Christian. 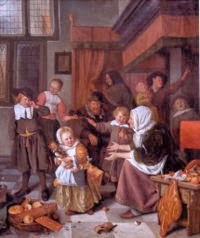 When they died in an epidemic, Nicholas took his inheritance and used it to help the needy, sick, and infirm. 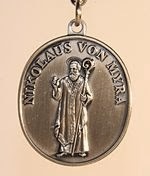 While still a young man, Nicholas became the Bishop of Myra. Because of his many miracles, he became known as Nikolaos the Wonder Worker. He enjoyed giving gifts to those in need – but always in secret so they would not know from whom the gift came – which is how he became the model for Santa Clause. One legend has him tossing three purses filled with gold coins through a poor man’s window so that each of his daughters could have a proper dowry and be able to marry. 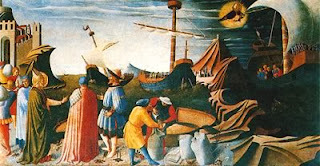 Of his miracles, it is said that during a famine in Myra, Nicholas asked a captain to sell him some grain from his three ships bound for Alexandria. The captain refused, saying that the cargo had been weighed and measured, and must be delivered intact. Bishop Nicholas told the captain that there would be no problem with the cargo’s weight. The captain unloaded 100 bushels of corn from each ship and continued on. When he arrived in Alexandria, the grain weighed what it had when the voyage began. With the 300 bushels of corn, Nicholas was able to feed the people of Lycia, and also provide enough seed for them to plant to keep them in food for another two years – until the famine ended. Sailors also have a special bond with St Nicholas. During a violent storm, sailors implored Bishop Nicholas to help them. The sailors then saw Nicholas appear on the ship and assist them in retying masts and getting the ship out of danger. When they landed in Myra they sought out the Bishop and asked how he had heard them and been able to help. Nicholas replied that a life devoted to God made the person clear-sighted and able to heed the calls of those in danger. 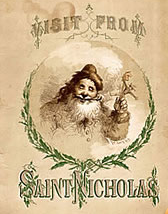 Throughout the centuries the legacy of St Nicholas traveled throughout the world. He became known as the protector of children and sailors. And has always been known for his heart-felt gift-giving. During the 12th century the Dutch and French began to celebrate St Nicholas Day by leaving gifts for those in need. The custom spread to other countries including Germany, Austria, Switzerland, and England. 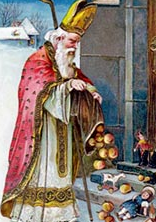 But it seems that St Nicholas didn’t really get embraced in America until the early 19th century. John Pintard, founder of the New York Historical Society, indorsed St Nicholas as the patrol saint of the city, and the society in 1804. 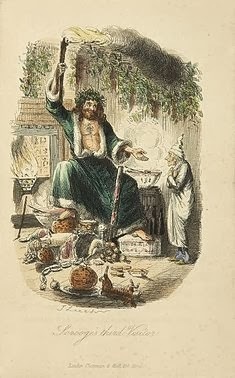 Just a few years later Washington Irving published Knickerbocker’s History of New York and mentioned a jolly St Nicholas-type figure. By 1810, Pintard had commissioned an artist to create an image for the American St Nick. Artist Alexander Anderson drew Nicholas placing treats in children’s stocking that were hung on the fireplace. and told of Santa Clause who lived at the North Pole and traveled by a sleigh, pulled by flying reindeer. 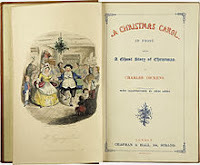 In 1823, A Visit from St Nick, or as it is better known now, “’Twas the Night Before Christmas” was published. This description of Santa formed the lasting American image of St Nicholas. 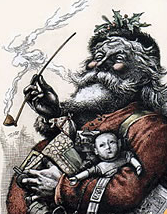 During the 1860’s and 70’s, Thomas Nast drew illustrations of Santa for Harper’s Weekly. 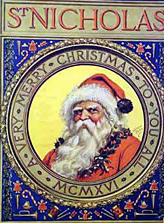 In his drawings Santa wore a long, white beard, and a red fur-trimmed suit, which covered a round belly. In many illustrations he was shown smoking a clay pipe. Somewhere during this century St Nicholas and Santa became intermingled. 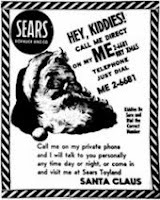 By the middle of the 20th century, Santa had gone commercial. Instead of giving gifts from the heart, as St Nicholas had, Santa became all about spending money on presents, and the more money, the better. 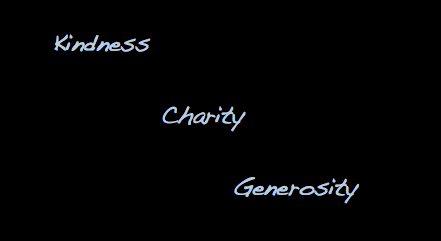 The expectation became give a gift; get a gift. Somewhere along the line, helping the poor, sick, and infirmed became a novel idea instead of the norm. 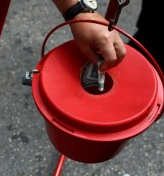 Commercialism had reared its ugly head and taken over the holiday, along with the spirit of giving. Maybe this should be the year we celebrate the season more in keeping with the way Bishop Nicholas would have: with kindness, charity, and generosity of spirit: some things even Santa might approve of. hey nice post mehn. I love your style of blogging here. The way you writes reminds me of an equally interesting post that I read some time ago on Daniel Uyi's blog titled How To Stay Positive Around Negative People During Christmas .